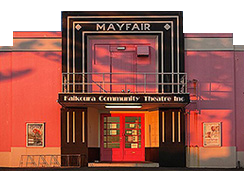 The Mayfair Theatre is a Kaikoura community owned cinema that screens the latest blockbusters and popular movies. Built in 1934 the theatre retains it's iconic art deco styling. The theatre available for hire for functions, weddings and performances. The Mayfair Theatre was purpose-built and opened it's doors on December 21, 1934. It has survived over the years through the help of the community and is run today by a committee of volunteers and paid staff. The Art deco heritage of the building has been preserved. In recent times the building has been repainted inside and out out and the seats are lovely and comfortable. As of November 21st, 2013 a new 3D projector was installed thanks to the support and initiative from the community. *For all 3D sessions a $2 glasses hire will be added to ticket price. Children under 5 are FREE but will need a ticket if using a seat and are subject to the 3D glasses hire fee on 3D screenings. All Credit Card transactions will incur an additional $0.50c fee.